Great ocean views. Access to recreational center with indoor pool. Very clean and well maintained. Excellent customer service! They called a couple of days prior to visit to make sure I had seen email of check in procedures. They were willing to answer any questions and said to call once we were in Carolina Beach if we had any questions or needed recommendations! Loved all hard surface flooring! The proximity to the beach was awesome! Very quiet and peaceful all times of the day! We love that Carolina Beach allows you to put up tents! We spent more time at the beach because of that! Great view from covered porch!! We will definitely return! Very quick response when needed. What else, beach front view! The remodeled condo was so nice and kept nice. Easy beach access. Bed was comfortable. Everyone is always super helpful and quick to answer our questions. We have throughly enjoy using A1 the last two years. The location was perfect. Easy acces to the beach and pool. Loved the bedrooms upstairs and no noisy neighbors above us. The condo is super clean and beautifully decorated. I would like to make a couple of recommendations. There is one couch and then only straight back chairs in the living room. It would be nice to see an additional comfy chair and ottoman or recliner. Also, the only trash can in the kitchen was a small bathroom sized can. We cook all our meals and it would have been nice to have a larger trashcan there. Overall, excellent property. We cant wait to be back on July 14th. The included linens was also a very nice addition to the rental. We loved the open space feel, and that multiple bedrooms had king or queen beds (not bunk beds). Very nice dining area that seated us all. Very spacious! Three families had plenty of room to spread out. The kids loved the second level with a play and bonus area. We loved all of it. The rooms are beautiful and we loved the view. You were always friendly and answered all our questions, giving us the information we needed. It was nice and comfortable and suited our needs. Team was very easy to work with. Provided helpful information and tips. We didn't encounter any problems at all. This condo was absolutely beautiful and we'll maintained. Everything we needed was provided. The covered parking area was great and allowed us to store all our beach items. The beach items provided were great too. There were even sand toys for the kids. Ocean views were breathtaking from the minute we walked in. Location to other activities was great too. We enjoyed exploring on the Coquina Outcrop and searching for shark teeth. The notebook provided by the homeowners was very helpful. We would definitely recommend this condo to everyone. Super fast communication and responded quickly (even after hours) with any questions I had. Everything about the Surf Shack was great! Check in was perfect, they email you the door code and you can go right in without having to stop at an office. It is a time saver when you just want to start your vacation. The beds and furniture were very comfortable and the building was nice and quiet. It was great to have a good amount of toilet paper, paper towels, and hand/dish soap in the unit. It was very handy to have a closet on the first floor where you park to store your beach things. There was a nice outdoor shower with benches to wash off the sand. Parking was easy. I highly recommend the Surf Shack and A1 Property Management. This was our second beach rental and first rental with A1, and A1 is outstanding. We will only be booking with this company from now on. We've only been in touch by email. Best experience. Thanks for accommodating our request to arrive one day earlier. Great, always prompt responses and information provided was very thorough. Oceanfront, balcony, plenty of room for everyone. Great service with easiest check-in and check-out of all my beach trips! 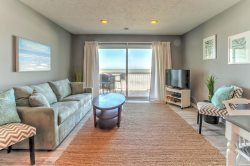 Wonderful condo just right for our family of 4. Nice to have indoor and outdoor pools. And a great view of the ocean from our balcony, All in easy walking distance to the tiki bar! We loved that the owners provided a welcoming atmosphere providing brochures and local information. The board games were so nice on a rainy day. The deck furniture was awesome and perfect for enjoying the view. The dishes and cookware were in good shape and the beds were very comfortable. We are planning to book again next year!! Great experience working with A1. They respond immediately to any questions or problems that might arise. We had a slight problem and David was there is no time. Thanks A1. Nice property and close to beach. Very clean and nice having linens provided for summer rentals. The A1 Team is just that.... A1. Communication and service is top notch! It was excellent! Quick, easy and efficient! Very clean, comfy and luxurious! We enjoyed all the little touches like extra k-cups for coffee, dish detergent, plenty of dishes to cook with. Beautiful condo! The whole A1 team was exceptional! Knowledgeable about the area and things to do, everyone was very friendly and personable which is something you don't often see in customer service these days! The first thing I noticed was the beautiful decor and the view! Got to enjoy the indoor and outdoor pools. Great beach time for the whole family. David and Chelsea were awesome at answering questions, making sure we got out check in instructions and made the whole process a breeze! Enough space for everyone, easy beach access, nice pool and we appreciated having all the comforts of home. Very responsive...I reported one of the ceiling fans was not working properly and in less than 24 hours it was replaced with a new fan. The view of the ocean, especially from the deck is amazing. It was a good experience. From my first call to book a home, to the last day with reminders for checking out, very prompt and nice contact. It was so spacious!! Lots of room to spread out and enjoy each other. I loved the elevator, but my family thought it was a little creepy. Kind of an off smell as well. It was great to get suitcases up and down. Beautifully furnished and so many plates, glasses, etc. Nice pool. Great balconies. Just an A-1 property- pun intended.